Talking of bias, as I was last night, one Arsenal fan I knew very well was hopelessly biased and yet always thought it was everyone else’s problem. 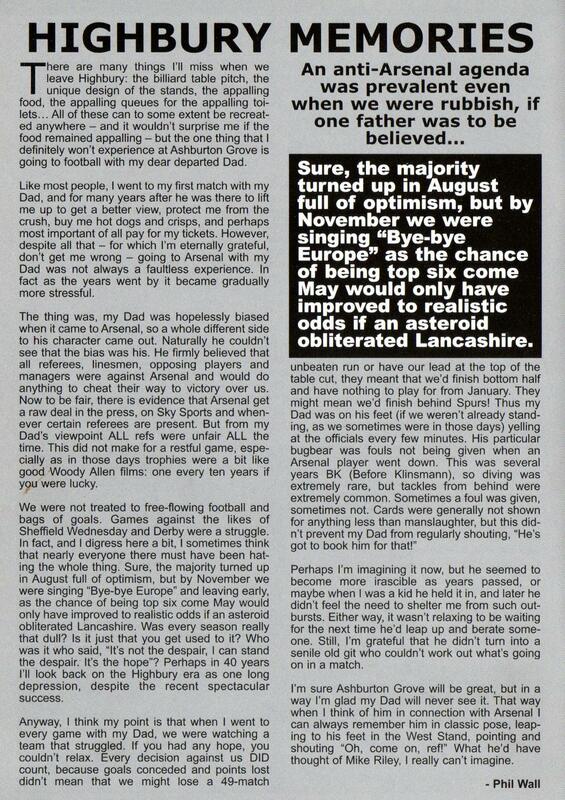 Here’s a piece from The Gooner issue 153 in January 2005, as our time at Highbury was coming to a close: a tribute (sort of) to my late father. There are many things I’ll miss when we leave Highbury: the billiard table pitch, the unique design of the stands, the appalling food, the appalling queues for the appalling toilets . . . All of these can to some extent be recreated anywhere – and it wouldn’t surprise me if the food remained appalling – but the one thing that I definitely won’t experience at Ashburton Grove is going to football with my dear departed Dad. Like most people, I went to my first match with my Dad, and for many years after he was there to lift me up to get a better view, protect me from the crush, buy me hot dogs and crisps, and perhaps most important of all pay for my tickets. However, despite all that – for which I’m eternally grateful, don’t get me wrong – going to Arsenal with my Dad was not always a faultless experience. In fact as the years went by it became gradually more stressful. The thing was, my Dad was hopelessly biased when it came to Arsenal, so a whole different side to his character came out. Naturally he couldn’t see that the bias was his. He firmly believed that all referees, linesmen, opposing players and managers were against Arsenal and would do anything to cheat their way to victory over us. Now to be fair, there is evidence that Arsenal get a raw deal in the press, on Sky Sports and whenever certain referees are present. But from my Dad’s viewpoint ALL refs were unfair ALL the time. This did not make for a restful game, especially as in those days trophies were a bit like good Woody Allen films: one every 10 years if you were lucky. We were not treated to free-flowing football and bags of goals. Games against the likes of Sheffield Wednesday and Derby were a struggle. In fact, and I digress here a bit, I sometimes think that nearly everyone there must have been hating the whole thing. Sure, the majority turned up in August full of optimism, but by November we were singing “Bye-bye Europe” and leaving early, as the chance of being top six come May would only have improved to realistic odds if an asteroid obliterated Lancashire. Was every season really that dull? Is it just that you get used to it? Who was it who said, “It’s not the despair, I can stand the despair. It’s the hope.”? Perhaps in 40 years I’ll look back on the Highbury era as one long depression, despite the recent spectacular success. Perhaps I’m imagining it now, but he seemed to become more irascible as years passed, or maybe when I was a kid he held it in, and later he didn’t feel the need to shelter me from such outbursts. Either way, it wasn’t relaxing to be waiting for the next time he’d leap up and berate someone. Still, I’m grateful that he didn’t turn into a senile old git who couldn’t work out what’s going on in a match. I’m sure Ashburton Grove will be great, but in a way I’m glad my Dad will never see it. That way when I think of him in connection with Arsenal I can always remember him in classic pose, leaping to his feet in the West Stand, pointing and shouting “Oh, come on, ref!” What he’d have thought of Mike Riley, I really can’t imagine. March 7, 2012 in Gooner Pieces, Misc. Lols. 9ice article men,ur dad must be an arsenal “die hard 4”. GOD bless his soul.